NOACA will NO LONGER process project applications for NOACA-administered Surface Transportation Block Grant (STBG) or Transportation Alternative (TA) funds for amendment to the NOACA Long Range Transportation Plan (Plan) or Transportation Improvement Program (TIP) on a quarterly basis. NOACA will amend the Plan annually for new projects and update the TIP with new projects every two years. 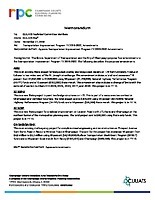 NOACA will only process proposed TIP amendments or projects eligible for concurrent Plan and TIP amendment as described Section IV of NOACA s Regional Transportation Improvement Policy NOACA will identify transportation system deficiencies and needs over the 20-year Plan by coordinating with transportation system owners and providers and using available system management tools and processes to review identified regional needs. Identified needs will be incorporated into the Plan in an optimum year to address the targeted deficiency. Once a need is on the Plan, staff will work with sponsors to develop complete projects that address the identified system need.